Honeywell (NYSE: HON), a leading Connected Home solutions provider, announced today that it is introducing the Honeywell Smart Home Security System, a self-installed, all-in-one security solution that is simple to set up and allows consumers to be aware of what's happening in and around their homes. This self-monitored system features Amazon Alexa, and can be upgraded and customized with accessories to fit your specific needs for the comfort and security of your home. The heart of the Honeywell Smart Home Security System is a camera base station with an integrated 1080p HD camera and 145-degree viewing that will incorporate facial recognition with push notifications so you can know when your child has arrived home safely from school. The camera base station is completely integrated with the Alexa Voice Service, a high-quality speaker and microphone. Easy to install out of the box, the system can be controlled through an app, your voice, and other optional devices. "More than 150 million homeowners already trust Honeywell with their safety, comfort and security," said Michael Flink, president, Honeywell Security and Fire. "Right out of the box and enabled by Amazon Alexa, our system allows customers to keep an eye on what's happening in and around their homes. As is the case with all of Honeywell's Connected Home offerings, the system can be enabled by location-based geofencing, which means it knows when you are at home or away." The Honeywell Smart Home Security System features indoor and outdoor sensors and motion viewers that can alert you if your doors or windows are opened, and can even keep an eye on your napping baby in another room. The camera base station and additional devices can be adjusted using a schedule, location-based geofencing, or customizable event and scene triggers. Audio and video self-monitoring is available directly through the app, and the Smart Home Security System also can send alerts inside the home with customizable lighting, sirens and video notifications through your app. In addition to being able to turn video recording off in the app, the camera base station includes a manual privacy shutter so you can be sure that what you want to stay private, stays private. The system will come with 24 hours of back-up cloud storage, which will be expanded to three days later this year. The Honeywell Smart Home Security System has a robust roadmap of features available in 2018, including facial recognition updates so people will be able to know when their kids come home from school or when the dog walker shows up. Also coming in 2018, audio analytics updates will enable the system to know the difference between an alert from your smoke or carbon monoxide (CO) alarm, your dog barking or other loud noises. "We applaud Honeywell for their commitment to listen to the 'crowd' in crowdsourcing ideas for their latest innovation," said Jonathan Cohen, chief enterprise solutions officer, Indiegogo. "Indiegogo's Enterprise offering will allow Honeywell to capture interest and validation while receiving actionable, product insights from consumers." 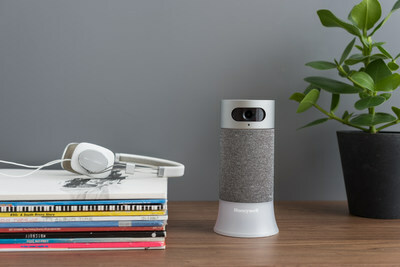 Honeywell's Smart Home Security System will launch through Indiegogo's Enterprise Crowdfunding service, allowing Honeywell to engage directly with backers, garner interest and provide real-time updates on how the system can continue to expand to meet people's needs. In addition to its new self-monitored security offering, Honeywell will continue to offer professionally installed and monitored security systems available through our global network of professional security dealers. To learn more about Honeywell's entire family of consumer and professional products for homes, including thermostats, water leak and freeze detectors, cameras, security systems and more, please visit http://yourhome.honeywell.com. Follow Honeywell Home on Facebook.com/HoneywellHome and Twitter.com/Honeywell_home. More information on Indiegogo can be found at Indiegogo.com, and you can follow Indiegogo at Twitter.com/indiegogo and on Facebook.com/indiegogo. Honeywell Home and Building Technologies (HBT) is a global business with more than 38,000 employees worldwide. HBT creates products, software and technologies found in more than 150 million homes and 10 million buildings worldwide. We help homeowners stay connected and in control of their comfort, security and energy use. Commercial building owners and occupants use our technologies to ensure their facilities are safe, energy efficient, sustainable and productive. For more news and information on Honeywell Home and Building Technologies, please visit http://www.honeywell.com/newsroom.